A father and daughter team will present a special lecture on two aspects of the history of caring for children in the South West. Dr Katherine Holden (UWE) will talk about the Downend Children's Homes and her father, Dr Hyla M Holden, will present his recent research on the wartime residential nurseries at Dyrham Park, near Bath, at an event on 8 November 2007. The lecture is organised by the Regional History Centre of UWE. Dr Hyla Holden is a retired doctor who is carrying out voluntary historical research for the National Trust. Dr Hyla Holden says, “At the outset of the 2nd WW many children were evacuated from major cities to the countryside to avoid the threat and destruction of bombing raids. In 1939, Lady Islington, at that time the tenant of Dyrham Park, ran a day nursery in London for pre school children and it was decided to move these children, around 50, to Dyrham Park. “In 1941 after major disagreements with the local authority, Lady Islington started a new residential nursery funded by the Anglo-American War Relief Fund for 80 children from West Ham. The records show that the children were well treated – with a programme of activities, play, good food and country air, a structured regime typical for the time. I have managed to trace several of the children's nurses, and many still meet to reminisce about their war work. Visiting was limited to once monthly; travelling in wartime was difficult, so many children received fewer visits and some none at all. “At the end of the war most of the children returned to their homes, although some had been orphaned during the war. One of the children I have managed to trace, a woman now in her 60's, says the hardest part of the whole experience was returning home. She exchanged a secure, regulated environment in a country mansion for a strange unknown city house and a family who were mostly unknown to her. “It has been very difficult to trace many of the children from the nurseries, but of the few I have met, many have spoken of a feeling of being 'the odd one out' when they returned to family life after their war time experience. At the same event, Dr Kath Holden will talk about the Downend group of children's Homes run by Bristol City Council in the 1940s. Some of the staff moved to work at these homes from the Dyrham Park Nursery after the War. 1. 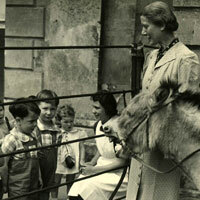 Children pictured with a donkey at the Anglo American Nursery at Dyrham Park during the Second World War. An official photo produced for the Ministry of Information showing the Anglo American nursery's secretary Miss Taylor and friends. (Reproduced by kind permission of the family of Myrtle Martin). 2. A garden party at the Anglo American Nursery. Lady Islington, Dyrham's wartime owner, is pictured (left, in a large white hat) with some of the evacuees. (Reproduced by kind permission of the family of Myrtle Martin).